The Environment Details page provides information about an environment and its settings. It also provides tools to manage the virtual machines and networks in the environment. Perform high-level actions, including copying the environment (in the same region or across regions), sharing it with other users by adding it to a project, and saving it as a template. Run, suspend, or shut down all of the VMs in the environment. View and edit the environment settings. See Popular actions for more detail below. 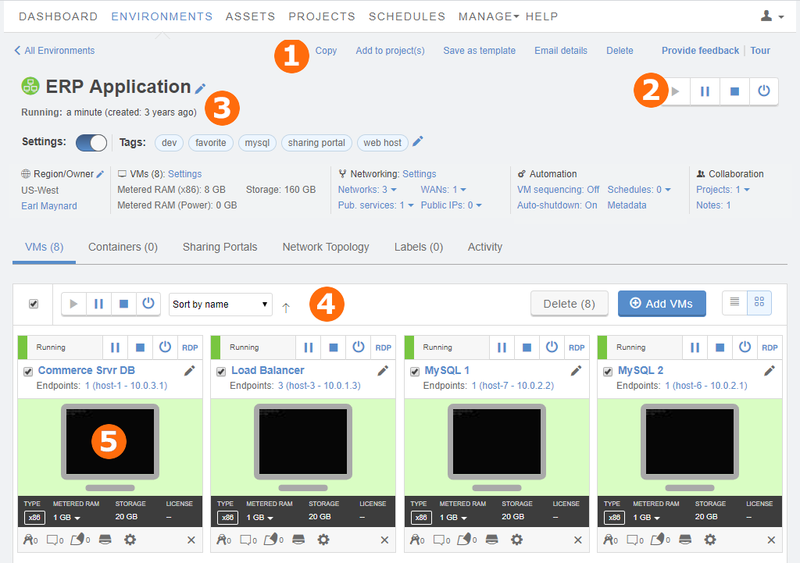 View and manage VMs in the environment. Click the other tabs in this section to view and manage Docker containers, add sharing portals to share access with users outside of Skytap, view network connections in the environment, add usage labels, or view recent activity and changes. Click the VM thumbnail to interact with the VM in your browser. Access a VM with your browser. Create a published service to access the VM over RDP, SSH, and more. Transfer files to and from a VM. Boot from an ISO file. Create a Docker container host VM. Find or edit usernames and passwords saved with the VM. Create a project to share an environment with other Skytap users. Share an environment with users outside of Skytap with a sharing portal. Add and edit labels, tags, or notes. Copy VMs or add VMs from other environments or templates. Control the startup order of the VMs in an environment with VM sequencing. Change the owner of the environment. Manage the environment network settings. View and edit VPNs and Private Network Connections attached to the environment. Enable or disable public Internet access. Add and edit labels for the VM. View, add, and edit credentials for VMs. Add CPU cores and RAM to a VM, or change its storage. Enable audio for a VM. View and change VM networking settings. View and change static public IP addresses and Skytap-managed DNS names attached to VMs in the environment. Schedule automatic start, stop, or suspend for an environment, or automatically save it as a template to create a backup. Automatically shut down or suspend an environment that isn’t being used. Find the ID of the environment for making REST API calls or integrating with plugins and automation packs. View the Network Topology of an environment. View recent activity in the environment.